The process of going to a music festival hasn’t changed much in the last few decades. The festival organizers find artists to perform, announce the lineup, set ticket prices, and sell the tickets to the public through various vendors. Once the ticket is purchased and verified, the festival goer has no real use for the ticket. Upon receiving admission, the transaction is essentially over between the vendor and the music fan. However, Justin Blau, who goes by the stage name 3LAU (pronounced like his last name), is aiming to revamp the festival experience using a tool not often paired with music: Blockchain Technology. Not new to blockchain, 3LAU stands far outside the crypto bandwagon. A finance major at Washington State (before dropping out to pursue music after his junior year), 3LAU gave up the Wall Street Executive fast track. Focusing almost exclusively on music after leaving school, he ran into the Winklevoss twins at a festival back in 2014. This encounter reignited his flame for finance, in particular, cryptocurrency. After a few months, 3LAU began devising methods to incorporate blockchain into his music. When his father suggested starting a blockchain music festival, 3LAU knew that he had to pursue the concept. Molding the idea into concrete elements, he committed hundreds of hours, thousands of dollars out of his own pocket, and maximum effort. Partnering with strategic executives across various music, finance, and technology companies, 3LAU has positioned himself as the CEO of OUR Music Festival, or OMF. At the helm of OMF, 3LAU and his carefully crafted team are committed to changing the festival landscape through decentralization. On October 20, 2018, the first blockchain music festival will take place in San Francisco’s Civic Center Plaza. OMF will be the first festival to incorporate blockchain technology (specifically Ethereum) into a fan-based experience. The lineup will feature Zedd, Big Sean, Matt and Kim, among and others who have yet to be announced. 3LAU, of course, will also take the stage. 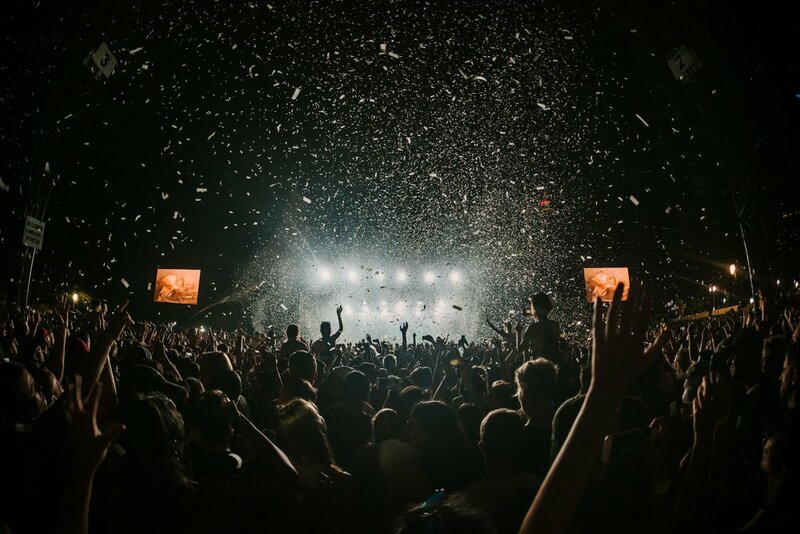 The introduction of blockchain to the music festival realm has the strong capability of bringing power back to the fans in the form of transparency and accountability. That’s really exciting because in recent years large corporations have taken over the festival industry and begun consistently pushing their own artist lineups and signing multi-festival deals that kill the variety that used to differentiate major festivals. As a group just starting out, we’re thrilled at the possibility of playing festivals being based more on popular opinion than corporate representation. 3LAU and OMF organizers believe that decentralizing the festival business through blockchain is the most efficient way to shift power back to the fans. Flaws in the festival scene, like ticket fraud, scalping, price inflation, ticket hoarding, and unnecessary fees, lie at the heart of OMF’s vision of improvement. OMF will revitalize the fan experience with incentives to participate in various activities inside the festival grounds, discounts on food, beverages, merchandise, rewards for early ticket purchases, friend referrals, and concert feedback. All of these potential fan values are currently nonexistent, or at the very best, extremely underutilized. 3LAU and his team are incorporating gradual change as to not deter festival-goers used to the traditional ticketing system. Too much initial overhaul could derail the festival before it gains real traction. To combat this, OMF will implement radical ideas over the span of a few years to troubleshoot more effectively and comply with federal regulations. In the inaugural year, OMF aims to release their OMF Token upon the completion of the event, as well as announce partnerships with festivals and other artists. These tokens to can be used for benefits like VIP experiences, ticket purchases, merchandise, and concessions. OMF likens their token to that of an airline miles program. A fan could purchase items with their OMF token, just like a frequent airline user can save up miles for flight perks. This token, of course, is not a physical token, but a form of currency that would exist in the user’s online crypto wallet. The structure behind cryptocurrency provides much more of a challenge than a frequent flyer program, but 3lau and his team are confident in their rollout strategy. The brains behind OMF understand that each fan may not be comfortable diving head-first into the crypto-currency market, and will initially use a hybrid ticket model. This model will still allow fans to purchase tickets with traditional money and use dollars on festival grounds. However, regardless of how the ticket is purchased, each OMF attendee will receive their own Ethereum wallet for continued use. Fans can dip their toes into blockchain and navigate Ethereum wallets without leaving behind the customary festival experience. In the not-too-distant future, 3LAU and OMF hope to transfer the power completely to the fans and allow them to utilize blockchain to pick the artists who will perform. While the fans will not be choosing the performers this October, OMF plans to bring this to fruition within a few years. Instead of large corporations controlling the decision making power, this could be the start of a fan-first festival norm. The journey will be long, expensive, and complicated, but disruptors like 3lau and OMF are working to turn festivals from a one-stop shop into a feedback-oriented ecosystem.